Some of Washington D.C.’s districts, or wards, are more impacted than others: Wards 7 and 8 are hard-hit as it relates to food access. According to a report by DC Hunger Solutions, only 3 supermarkets serve the 150,000 residents in Wards 7 and 8, whereas the 82,000 residents of Ward 6 have 10 supermarkets. Recently, we combined our expertise in and devotion to community engagement and healthy food by hosting a volunteer session as part of Martha’s Table’s Joyful Food Markets program during the annual conference of the Opportunity Finance Network (OFN), a national network of CDFIs. Martha’s Table, a local non-profit, launched its Joyful Food Markets (JFM) program in 2015, and it is now offered in 39 schools exclusively in Wards 7 and 8. Each month, the markets offer families the opportunity to sample produce, enjoy chef-led culinary demonstrations, dance to music, get excited about healthy recipes, and bring home selections of fresh produce and healthy non-perishable items for free. Chef Jojo chats with volunteers at a Joyful Food Market at KIPP DC’s Promise Academy. Martha’s Table relies on the engagement of a robust volunteer corps to keep these markets running, which was a perfect opportunity for OFN conference attendees to pitch in and see how the model works. Representatives from my team at Capital Impact, along with others from the Self-Help Ventures Fund, Finance Fund of Ohio and ICA Fund Good Jobs put on aprons and gloves and got to work. 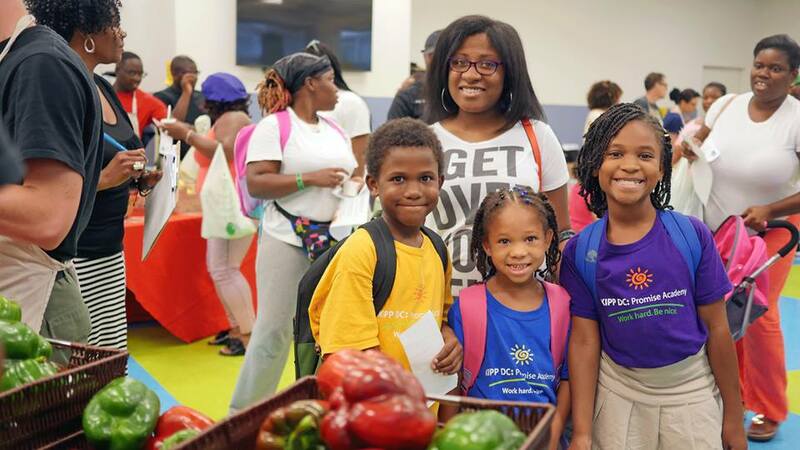 The Joyful Food Market event was hosted at KIPP DC’s Promise Academy, a public charter school in Washington D.C.’s Ward 7 offering a college preparatory curriculum in addition to a suite of enrichment programs. Among the 721 students enrolled in kindergarten through fourth grade, 168 children and their families were served at the inaugural market, in addition to the 23 school staff members. Martha’s Table’s Chef Jojo showed volunteers how to make batches of kale and apple slaw to showcase the food items that were being offered at that month’s Joyful Food Market. Students were eager for taste-tests, watching our volunteers prepare the slaw before their eyes. By the end of the day, we had moved pallets of onions and apples, trimmed kale into bunches, and watched student after student enjoy crunching into apples. The kids who came through the market were excited, happy and smiling, asking their parents and guardians to let them help make some of the recipes they’d seen at home. It was just another day at a Joyful Food Market, but all the volunteers were glad to be a part of it and the impact it was having on the local community in that moment. Some of our communities have experienced historical disinvestment in fresh food access, resulting in a replacement of healthy and local food establishments with a disproportionate concentration of highly processed, low-nutrition fast food. 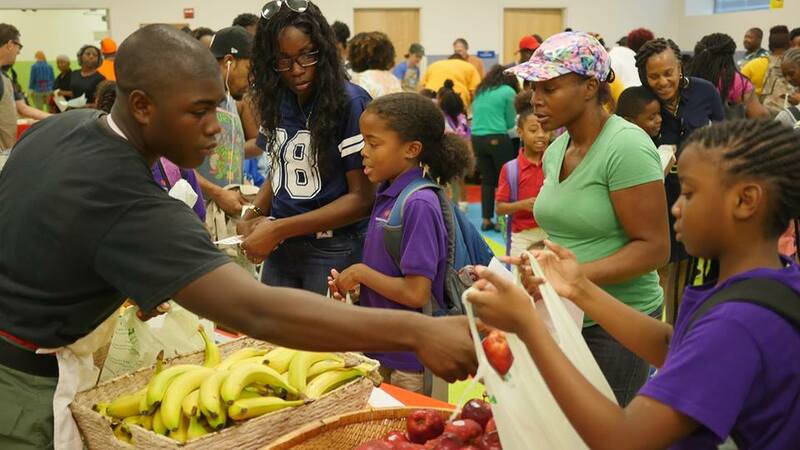 Capital Impact works with communities across the country to expand access to healthy foods. In D.C., for example, we are working with Martha’s Table on its relocation and expansion as part of “The Commons at Stanton Square,” a new three-acre, community-services campus development project in Ward 8. It will address key disparities in this low-income community by bringing together a variety of key social services including health care services and affordable housing while spurring community development. Martha’s Table’s contribution to the city is not small. Services provided at the new headquarters will include a branch of its popular preschool program, food distribution, nutrition and parenting workshops. Opened 35 years ago, Martha’s Table now reaches more than 18,000 people through its food, education and thrift store programs with significant support from 18,000 volunteers every year. In 2015, Martha’s Table served more than 1 million meals, distributed free clothing and housewares to more than 10,000 neighbors in need, and provided education to more than 200 children and older youth. The Michigan Good Food Fund (MGFF) is another example of Capital Impact’s commitment to healthy food access. More than 30 percent of Michiganders are obese—the second highest rate of obesity in the Midwest region. This disproportionately impacts communities of color. MGFF is a public-private loan and grant fund created to finance healthy food production, distribution, processing, and retail projects that benefit underserved communities throughout Michigan. This includes supermarkets, grocers, community markets, co-ops, food distributors and others working to increase access to healthy food for Michigan children and families. Created in partnership with the Fair Food Network, Michigan State University Center for Regional Food Systems and the W.K. Kellogg Foundation, this unique program supports projects that increase access to healthy food, spark economic development, and create jobs in the communities that need it most. Every community deserves the ability reach its full potential, and healthy food is a major force in achieving future success. Healthy food, education, affordable housing and many other factors intersect on the path to inclusive growth and shared prosperity. Supporting communities and organizations to address their healthy food needs empowers individuals to overcome structural barriers and achieve greater equity. It’s a privilege to bring both our capital and our personal commitment to support Martha’s Table and our greater Washington, D.C. community in achieving just that.